The Queensland election was decided overwhelmingly on state factors, as Malcolm Turnbull was quick to say on Sunday, but inevitably it has fallout for the prime minister. Four implications are obvious in the result, which ABC election analyst Antony Green predicts will be a majority Labor government, while Inside Story’s Tim Colebatch suggests is more likely to be an ALP minority one. First, it elevates even higher the importance of the December 16 byelection in Bennelong. Second, it will further unsettle an already depressed and jittery federal backbench. Third, the federal Queensland Coalition MPs will want greater attention from the government. Finally, the Nationals – in particular the Queensland Nationals – will accelerate a trend that’s been obvious recently, which is to differentiate their brand. Bennelong was always destined to be significant, from the moment Liberal MP John Alexander resigned (some government sources think prematurely) in the citizenship crisis. But now that things have gone badly for the Liberal National Party in a state that looms so large for the federal Coalition, the stakes rise. Turnbull was campaigning in Bennelong on Sunday, falling back on the tried and trusted ground of border protection, claiming that “right now the people smugglers are using Kristina Keneally’s articles, her statements on this, as a marketing tool” (an assertion surely worthy of a factcheck). He has to get deeply involved in this seat, which is on a 9.7% margin, but the flip side is that the more effort Turnbull puts in, the more he’d be personally identified with a big swing, let alone a loss. On the other hand, if the swing were contained, that would help him. Psychologically, the Queensland result will send the Coalition’s federal members deeper into the funk caused by the unending run of bad polls and multiple problems engulfing the government. This will accentuate instability and ill discipline, although there is no tangible challenge to Turnbull’s leadership at this point. The Queensland vote reinforces the now familiar message that people are turned off the major parties. The mid-30s primary votes for Labor (around 36%) and LNP (about 34%) scream disillusionment. One Nation polled solidly in minor party terms (around 14%) and very strongly in its heartlands, but it couldn’t turn that into the swag of seats it had boasted about. Pauline Hanson’s party fell victim to the inflated expectations it had raised, while the LNP vote fell victim to One Nation. The result shows the One Nation phenomenon, in terms of its ability to erode the conservative vote, remains a worry, but it does not look like a party on the move. The Queensland result particularly resonates in Canberra because of how vital that state will be to the Coalition come the election. Federal government members from Queensland will be defensively assertive. Even before the election, internal chatter had it that senior Queensland Liberal George Brandis would not move out of parliament in the coming reshuffle, as earlier predicted. Revamping cabinet without Brandis while preserving strong Queensland representation would be challenging – and Turnbull could not afford to have Queensland seen to be downgraded. The federal Queensland Nationals are determined to strengthen their efforts to distinguish themselves from the Liberals and Turnbull. Nationals cabinet minister Matt Canavan said on Sunday the state result was a “confirmation of how important it is to have a strong National Party at a federal level”. Nationals MP George Christensen went so far as to issue an apology to One Nation voters. It won’t endear him to Turnbull, but he won’t care. One Nation is on track to win Mirani – from Labor – a seat that adjoins Christensen’s electorate with a small overlap. Queensland Nationals senator Barry O’Sullivan believes the result shows One Nation is not a threat in terms of House of Representatives seats, but highlights the need for the Coalition to fill the vacuum that party has occupied. “Malcolm can’t do it himself,” O’Sullivan says. Rather, he says, Turnbull has to allow the Nationals to do this. O’Sullivan is not one who advocates the de-amalgamation of the LNP in Queensland – as some are doing – but a “divisionalisation”, reinforcing the message of the separate Liberal and Nationals strands within the one party. This is already underway, with O’Sullivan’s bill for a broad-ranging commission of inquiry into banking and other financial institutions, on which he will have final consultations with sympathisers within the Coalition and other parties on Monday. He then intends to move a motion in the Senate to have it dealt with immediately after the marriage bill is finished there, and debated until it is resolved. Christensen is ready to back it in the lower house. Treasurer Scott Morrison is still trying to land initiatives to show the government is acting on the banks, short of a royal commission. One wonders what Peter Dutton, Liberal holder of a marginal Brisbane seat, who last week was open to the government softening its opposition to a royal commission, is thinking right now. Theresa May’s gamble on calling an early election has not paid off. A little over a week before the 2017 UK general election, the improbable occurred. 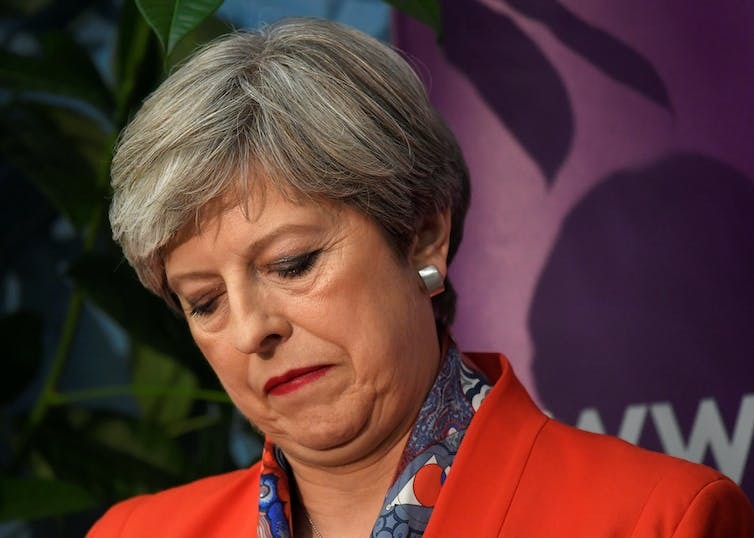 A poll indicated that Prime Minister Theresa May could lose the Conservative majority. The shadow of a hung parliament was cast over the UK parliament again. It was a claim credible enough to the markets for the sterling to drop. Most political analysts, however, did not take it seriously. But these are unconventional times. There is an unlikely president in the White House. No pundit predicted Brexit. And now, a Labour Party led by an “anti-politician” in Jeremy Corbyn has delivered a hung parliament. While Theresa May will soon be on her way to Buckingham Palace to ask the Queen’s permission to form minority government, the unlikelihood of a stable coalition government means Britons may be heading back to the polls much sooner than they expected. Among its causes is complacency in rich Western nations, as well as disinterest in institutions (especially from the young). Many see anti-politics as a tide sweeping away much that was previously taken for granted. According to leading UK scholars, anti-politics is not a democratic de-alignment as much as the result of political realignment. In other words, it is not that we are turning off democracy – but that we are turning away from political elites and major party politics. A recent Australian survey found righteous indignation among its citizens. This anger is directed at parties and politicians who are swayed by the quest for power and seem to break promises without impunity. One of the significant lessons from the 2017 UK poll is that “anti-politics” voters are no longer welded on to any one party. There is growing volatility in the UK electorate. In the 1960s, less than 10% of voters changed their allegiance between elections. In yesterday’s poll it was closer to 40%. Thanks to anti-politics, gone are the days when voters supported a political party in the way they might support the family football team. But how then do we explain the strongest combined major party vote for two decades (Conservative 43 / Labour 40)? Does this suggest a return to two-party politics? No, because one side – Labour – was playing anti-politics. There is no doubt that no-one expected the dramatic growth in the Labour vote. But there are two stories to tell. First, the support for Corbyn came against economic and political convention. Labour focused on larger cities and university towns, targeting students, service industries and the public sector. It promised to end austerity, nationalise utilities, increase taxes, and invest heavily in public services. It was an anti-political appeal. Second, the Labour vote was a big enough to hamper the Conservatives, but not much more. Despite Labour’s celebration over approximately 30 seats, the 2017 result is only eight seats more than when it lost power in 2010. The reality is that Labour is little closer to the 60-plus seats it needs for power than it was last week. What will make this a potentially insurmountable gap is an unacknowledged divide in the UK electorate. Recently, UK researchers analysed the 2015 UK election results. They found that anti-politics attitudes spread across all voter groups. But what was really challenging for parties was not a traditional split along class lines, but a growing “bifurcation” in the vote of cosmopolitan and provincial England. Cosmopolitan voters had benefited more from globalisation, were more outward-looking, pluralist and open to the EU. In contrast, those in provincial regions of economic decline were more inward-looking, illiberal, and negative toward immigration. Perhaps there are no great surprises here. But what is interesting is that this division had real effects that challenged political parties. In other words, these shifts made it harder for larger parties to develop a platform that spans these “two Englands”. In 2015, this resulted in cosmopolitan votes for Labour and the Greens. It saw provincial support for UKIP and an element of both for the Conservatives. This suggests that the Conservatives’ 2015 success was due to being more adept at targeting appeals to both cosmopolitan and provisional electorates, while being more pragmatic around taking nationally consistent positions. What happened in the 2017 general election? While the Conservatives won 5.5% more of the vote (but lost a dozen seats), Labour won a 7% swing in cosmopolitan areas that had voted Conservative and “Remain”. While participation was up 2.6% overall (up from 66.1% in 2015), it rose by over 5% in seats Labour won. On the back of record youth enrolment to vote, Labour surged in the youth vote in cosmopolitan areas. Meanwhile, Conservative London cosmopolitan seats changed hands, while Labour won university seats like Sheffield Hallam from the Liberal Democrats. Yet the challenge for Labour remains. Its wins were cosmopolitan, with little progress in the provincial areas that it needs for a majority in the future. Meanwhile, the Conservative appeal to provincial England through an emphasis on Brexit and bringing down net migration were successfully targeted at a collapsing UKIP and winning some SNP seats. But it compromised the Tories’ cosmopolitan wins from 2015. Here lies the challenge for all large party leaders: how do they connect with prevailing moods in both cosmopolitan and provincial areas when they diverge in such opposite directions? What might this mean for Australia? It is not unreasonable to suggest Australia may be seeing its own version of the “bifurcation” challenge. Australian demographer Bernard Salt has already identified a tale of two nations. And as Ken Henry recently observed, the Australian population continues to grow beyond the capacity of existing capital cities and puts pressure on economic performance and infrastructure planning. This can only contribute to “two Australias” that are divided by geography, economic opportunity and even identity. Meanwhile, some states (hit hard by globalisation) have turned to provincial, protectionist and issue-based politicians. And, as national votes become harder to span, the notion of slim majority as mandate will become even more problematic. Many argue that former prime minister John Howard’s ability to win traditional Labor voters was at the heart of his sustained electoral success. However, the challenge for today’s Australian leaders is more complex than it was during the Howard era. Not only must they manage competing ideologies in their parties and span diverging nations, they must also respond to a volatile electorate that is decidedly “anti-politics”.